Download "GCloud 7 Hybrid Cloud Management Service- Service Description Issue 1"
1 Overview of the Hybrid Cloud Management Ideal recognise that enterprises wishing to leverage hybrid (private and public) cloud infrastructure face a number of key technical and organisational challenges: Providing secure and resilient connectivity between on and off premise infrastructure Using new and unfamiliar user interfaces to manage and control remote virtual workloads Creating security policies that are consistently enforced wherever a virtual machine (VM) might be hosted Having the flexibility to move workloads between providers with minimal effort and risk Moving workloads to and from the cloud using a straightforward and consistent process Cisco Intercloud Fabric for Business (ICFB) is a management platform that unifies connectivity, management and control between private and public infrastructures. 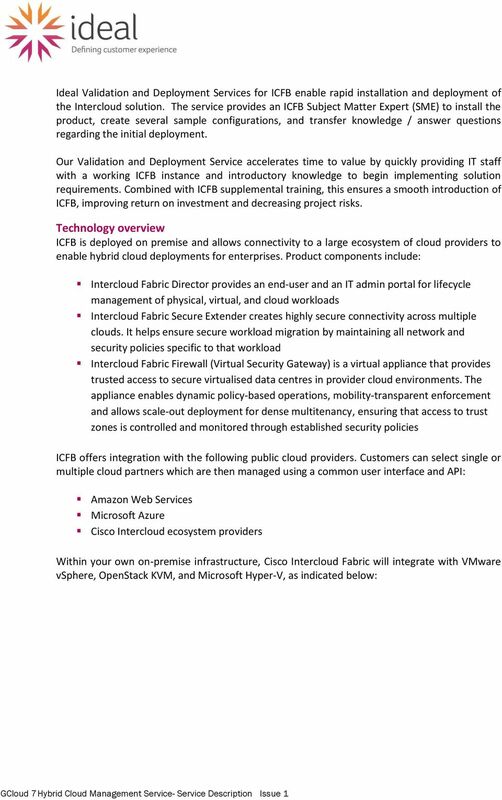 ICFB provides a hybrid cloud solution that enables enterprises to easily and securely connect the enterprise data centre to the public cloud as needed and on demand. 4 unify all technical functions covering VM management, firewall policy and configuration compliance. Ideal Networks offer three different approaches to adopting ICFB so that the customer can select the right level of support to work with their own in-house IT specialists. 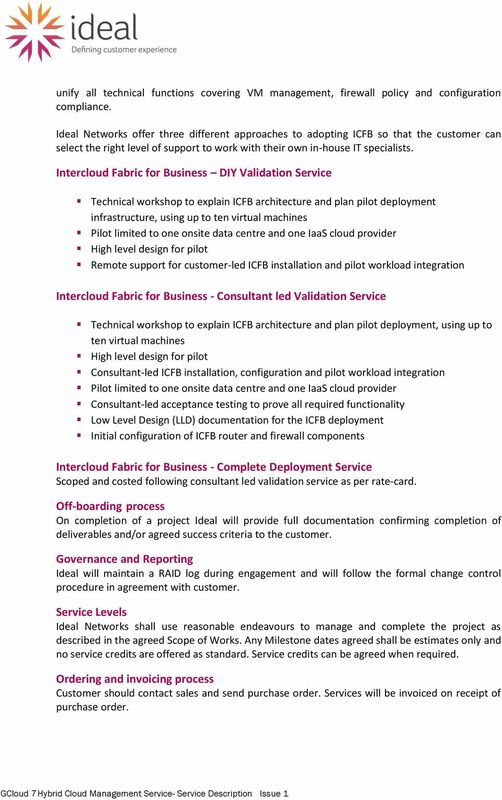 Intercloud Fabric for Business DIY Validation Service Technical workshop to explain ICFB architecture and plan pilot deployment infrastructure, using up to ten virtual machines Pilot limited to one onsite data centre and one IaaS cloud provider High level design for pilot Remote support for customer-led ICFB installation and pilot workload integration Intercloud Fabric for Business - Consultant led Validation Service Technical workshop to explain ICFB architecture and plan pilot deployment, using up to ten virtual machines High level design for pilot Consultant-led ICFB installation, configuration and pilot workload integration Pilot limited to one onsite data centre and one IaaS cloud provider Consultant-led acceptance testing to prove all required functionality Low Level Design (LLD) documentation for the ICFB deployment Initial configuration of ICFB router and firewall components Intercloud Fabric for Business - Complete Deployment Service Scoped and costed following consultant led validation service as per rate-card. Off-boarding process On completion of a project Ideal will provide full documentation confirming completion of deliverables and/or agreed success criteria to the customer. Governance and Reporting Ideal will maintain a RAID log during engagement and will follow the formal change control procedure in agreement with customer. Service Levels Ideal Networks shall use reasonable endeavours to manage and complete the project as described in the agreed Scope of Works. Any Milestone dates agreed shall be estimates only and no service credits are offered as standard. Service credits can be agreed when required. Ordering and invoicing process Customer should contact sales and send purchase order. Services will be invoiced on receipt of purchase order. 5 Termination terms Termination terms from standard Ts and Cs apply. 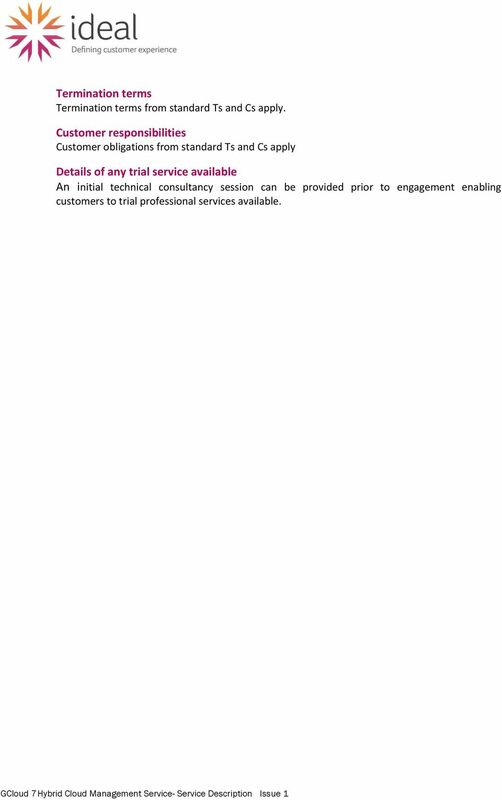 Customer responsibilities Customer obligations from standard Ts and Cs apply Details of any trial service available An initial technical consultancy session can be provided prior to engagement enabling customers to trial professional services available. 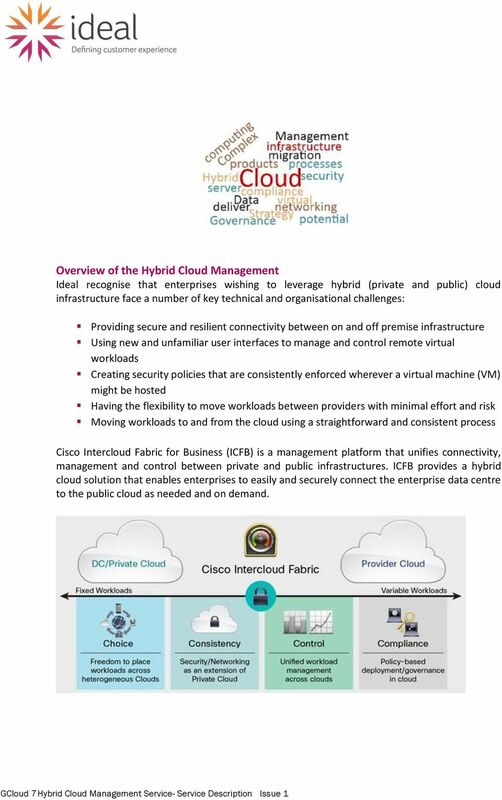 Reference Architecture Cisco Hybrid Cloud Solution: Deploy an E-Business Application with Cisco Intercloud Fabric for Business Reference Architecture 2015 Cisco and/or its affiliates. All rights reserved. Ordering Guide Cisco Nexus 1000V Switches Ordering Guide February 2014 F further infmation, questions, and comments please contact n1k_dering@cisco.com. 2014 Cisco and/ its affiliates. All rights reserved. OpenStack Cloud Migration: Cloud Migration from VMware to OpenStack July 07, 2015 DONGJOON MIN ISA TECHNOLOGIES,INC. 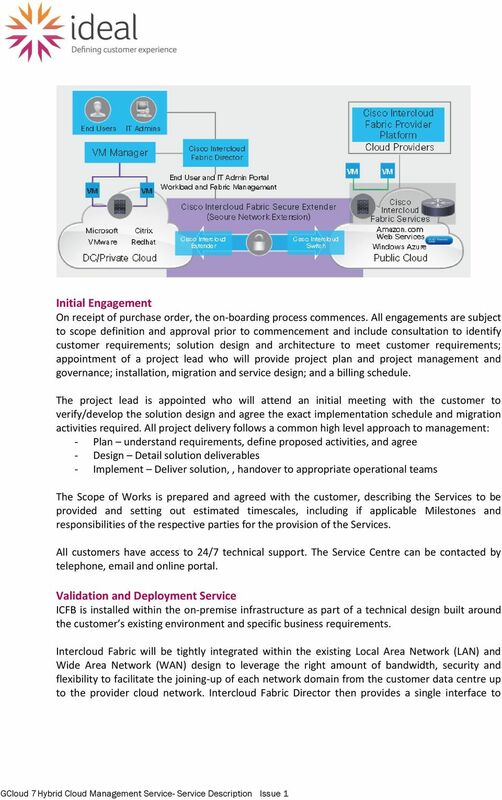 djmin@zconverter.com 1 Table of Contents Executive Summary.. 3 What is V2C Cloud Migration..